For the third year in a row, John O’Connell High School is hosting a car show contest. The car show has become a major fundraiser for the school. All proceeds go towards O’Connell’s after school programs, student class projects and other school activities. The event begins at 10 a.m. on Sunday, May 1 and goes till 4 p.m. in the schoolyard behind John O’Connell High School (2355 Folsom st.) Judging will be ended by 3:30 p.m.
Students say it’s an opportunity to celebrate Latino culture during Cinco de Mayo weekend in the Mission District and for the community to learn about their school. “It’s something that a lot of adults enjoy, and youth too,” said [Jailene] Medina, who’s graduating this year. Now Medina is passing on the car show tradition to freshman Devianna Roca. 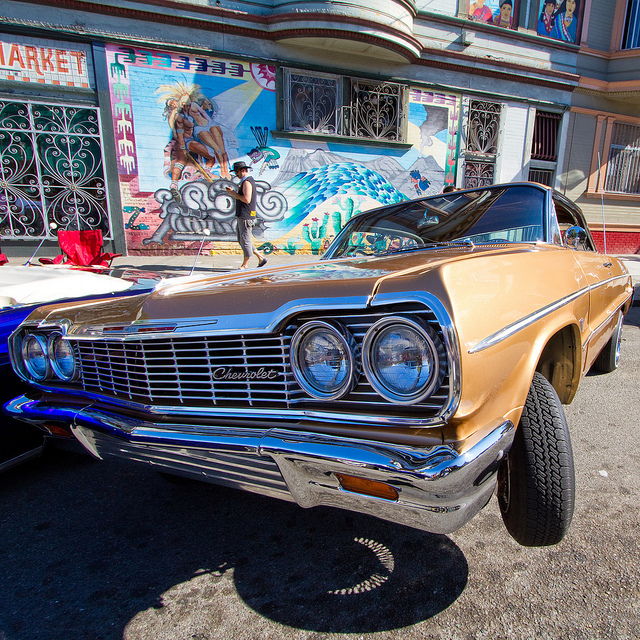 Medina and Roca both grew up in lowrider families, with Medina’s father owning a 1964 Impala and Roca’s father owning a 1968 Impala, which he plans to enter in the show. I grew up in the Mission, went to School of the Arts high school for creative writing. Bounced around colleges from SFState, to CCSF, to CCA where I graduated with a degree in photography.